To make a fused plastic tote bag, first you need to fuse your plastic. I posted a tutorial detailing this process for you. You will want to make a large sheet to make your bag out of and a smaller strip to make your straps out of if you wish to make your own straps out of plastic. I used my strap tutorial for making the straps on this bag, except that I did not need to iron these or use any interfacing. I simply folded my plastic, pinned it, and sewed it. You can see the folded straps waiting to be sewn on the right. First trim your plastic, removing all the loose and thin edges. Aim to get yourself a perfect rectangle. Then fold the large sheet of plastic in half. Sew all the way around three sides (including the folded side), leaving the top of the bag open. 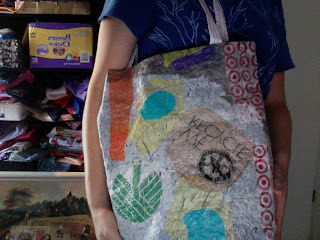 I sewed up the folded side to make the bag look more uniform, with a seam on each side. At this point you have a basic bag. If you would like to box out the bottom corners, you will fold down a triangle on each side and sew it down, measuring to make sure they are even. If you are unfamiliar with this process, here is a tutorial that explains it in detail. After sewing down the corners, trim the top of your bag (if necessary) to make it nice and straight. Then fold down the top to make a nice clean edge. You can fold it down as much or as little as you want depending on how tall you want your bag to be. Sew this edge down all the way around the top of the bag. This is easier the bigger the bag is because this fabric isn't the most flexible stuff and can be hard to turn around on your sewing machine. Attach your straps. I recommend using a box with an "X" in it to really secure them down. There are certainly ways of doing this that won't leave any unfinished seams and stuff, but I'm okay with a little imperfection on these sort of projects! Here is my finished bag! P.S. If this tutorial is at all confusing, there are dozens of great tutorials for easy-peasy tote bags. You can used fused plastic to make any of them, so feel free to hunt down other tutorials if you want to! I make it, great. If not, I going to continue to do my thing and have fun, Segura said. Have so many good shortstops in the league. "We were able to issue a directive. Jenn Wilmot says the Charleston VA encouraged her to reapply, and then rejected her. There are only 13 approved caregivers on the program there. [The 5 biggest questions after Italy's elections gave a lift to populists]They generally aren't donald trump shirts winning enough support to govern. But they are claiming such a substantial share of the electorate that ithas become all but impossible for the establishment to govern on its own. The result is a continent caught in a netherworld between a dying political order black lives matter shirt and a new one taking root. "This has been a post ideological result, beyond the traditional left right divide," said Luigi Di Maio, whose populist Five Star Movement trounced its opponents to become Italy's largest party Monday.Police take on students opposing a neo fascist party in Milan on Feb.
Men beach volleyball has taken a back seat to the Aussie women game since the 2000 Olympics but said he was stoked Australia could see such a high quality match and a home town win. Guys (Canada) are so good, they are a top ten team in the world for a reason and for the public to see a good quality, live, prime time, it warms our heart because we often don get to do this in Australia McHugh said. Are often overseas somewhere no one knows what is going on. David Gale has obviously taken care over the menu. There are, in fact, three menus the A La Carte, the Garden Menu (for vegetarians) and the black lives matter t shirt Kitchen lil pump shirt Menu (which offers a set menu at a more reasonable price). The emphasis is on English and grinch shirt European cuisine, with locally sourced ingredients taking pride of place and the odd twist to keep things interesting.